Three AAE students were honored during spring break in Washington D.C. after being selected as “Tomorrow’s Leaders: The 20 Twenties.” Aviation Week Network, in collaboration with the American Institute of Aeronautics and Astronautics (AIAA), chooses the recipients. Blacker is a master’s student working with Professor William Anderson on research that studies lifted flames in a traverse-unstable rocket engine combustor. When choosing a graduate school, he was enticed by Maurice J. Zucrow Laboratories. He says his research can only be done using data from Zucrow. Harroun is a master’s student under Stephen Heister, the Raisbeck Engineering Distinguished Professor for Engineering and Technology Integration, conducting computational research into how to design a rocket nozzle for a rotating detonation engine (RDE). Patel is a senior working with Assistant Professor Professor Alexey Shashurin. 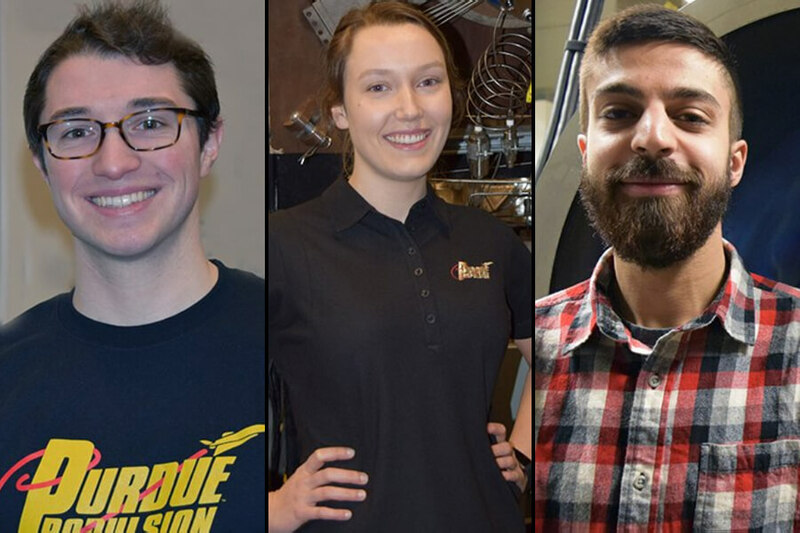 His initial research was focused on electric propulsion, but now is focused on a new project – developing a novel low-energy surface flashover (LESF) igniter subsystem for pulsed plasma accelerators. From left to right: The students are Aaron Blacker, Alexis Harroun, and Adam Patel. Blacker and Harroun attended the 62nd Annual Laureates Awards on March 14 at the National Building Museum in Washington D.C. Patel, who was previously scheduled to start a study abroad program in Greece, could not attend.